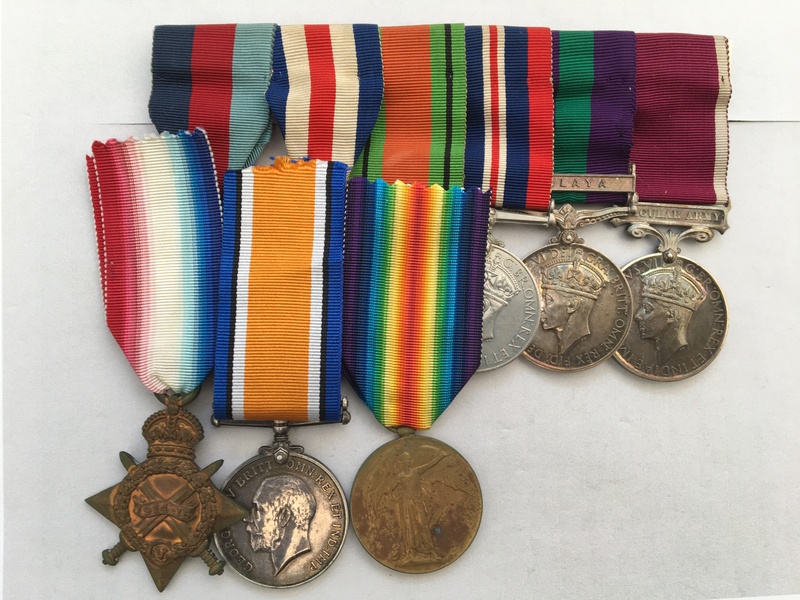 A WW1/WW2 family medal group to (WW1) T3-029561, Driver/Private (later Acting Corporal) Henry Thomas Ball, who served with the Army Service Corp and his son, (WW2) 2309757, Sergeant (later Captain) T. H. Ball who served with the Royal Signals. 1914-15 Star named to T3-029561 DVR: H.T. BALL. A.S.C. 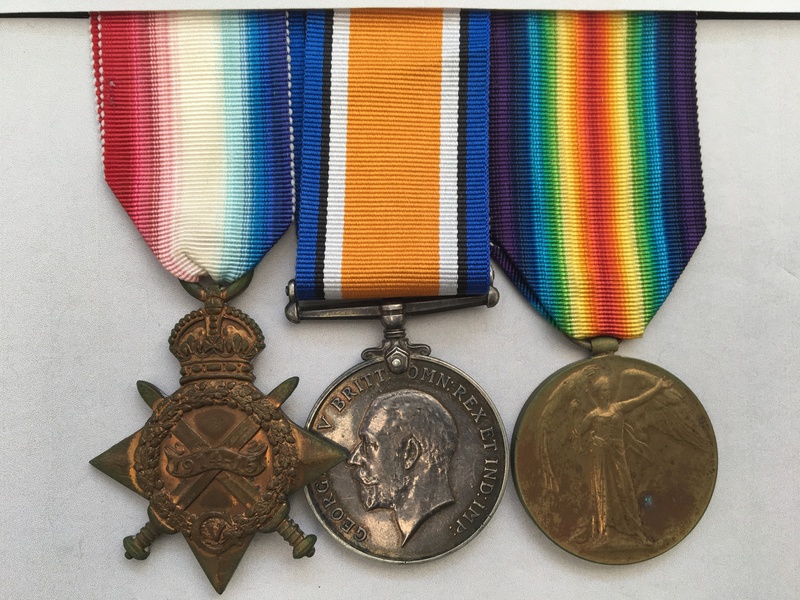 British War Medal & Victory Medal named to PTE: H.T. BALL. A.S.C. General Service Medal (clasp MALAYA) named to CAPT. T. H. BALL. R. SIGS. Army Medal For Long Service & Good Conduct named to 2309757 SUJ. T. BALL. R. SIGNALS. Further details of WW2 medal award criteria, can be viewed by clicking on here and scrolling to the relevant medal entry. Further details relating to the General Service Medal can be viewed by clicking on here and the Army Long Service & Good Conduct Medal can be viewed by clicking on here. 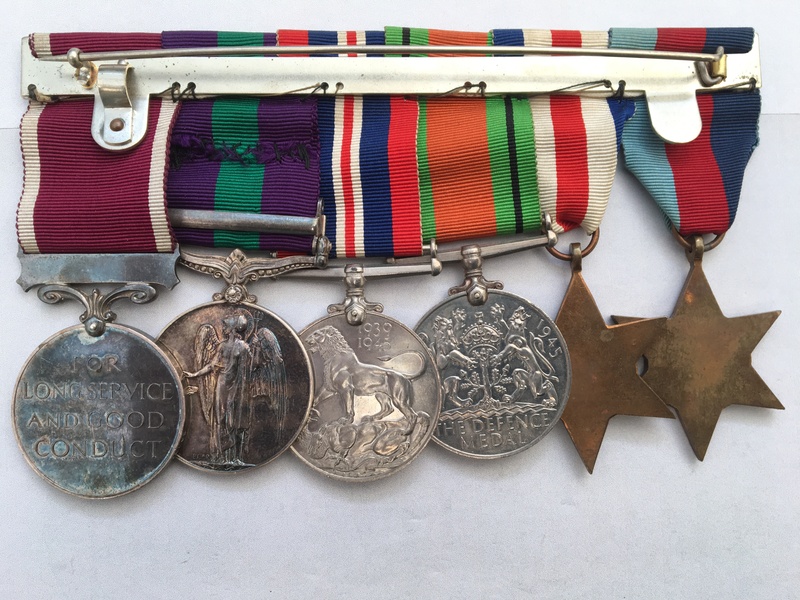 The WW1 medals are loose with some length of ribbon, the WW2 medals are swing mounted with their original ribbons. Henry Thomas Ball, who lived in Tooting Grove, Lambeth, London, was born in 1878 and worked as a labourer prior to WW1 and enlisted into the Army Service Corps at Aldershot on the 20th November 1914. According to his Medal Index Card, which can be viewed by clicking on here, (if you have access to Ancestry, although a paper copy will be provided), Henry Thomas Ball entered France with the Army Service Corp on the 24th September 1915. 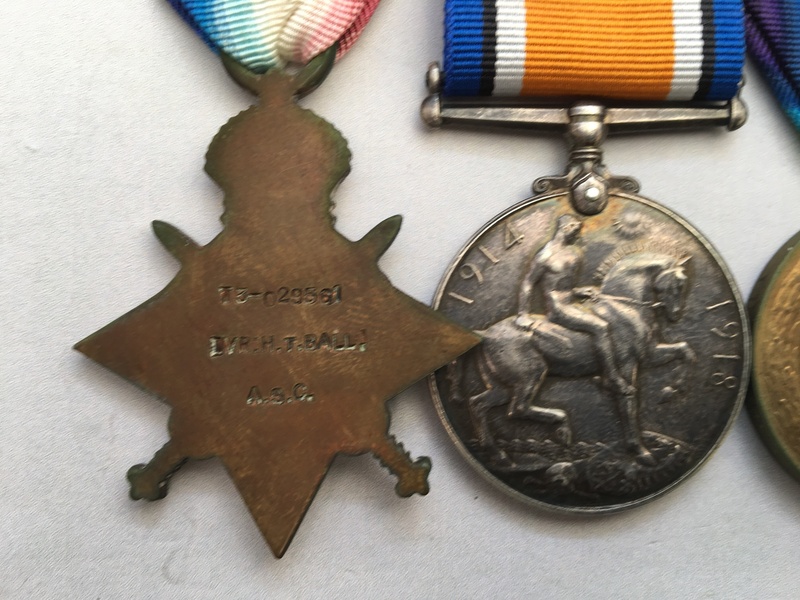 He was later discharged from the service, due to ‘sickness’, in April 1918, he was entitled to a Silver War Badge, details of which can be viewed by clicking on here, (again if you have access to Ancestry, although a paper copy will be provided). The history of the Army Service Corp in which he served can be viewed by clicking on here. Thomas Henry Ball’s service records can also be viewed by clicking on here, (again if you have access to Ancestry, although a paper copy will be provided). It should be noted that he has a 13 year old son called Thomas Henry Ball. Thomas Henry Ball was born on the 11th November 1901. 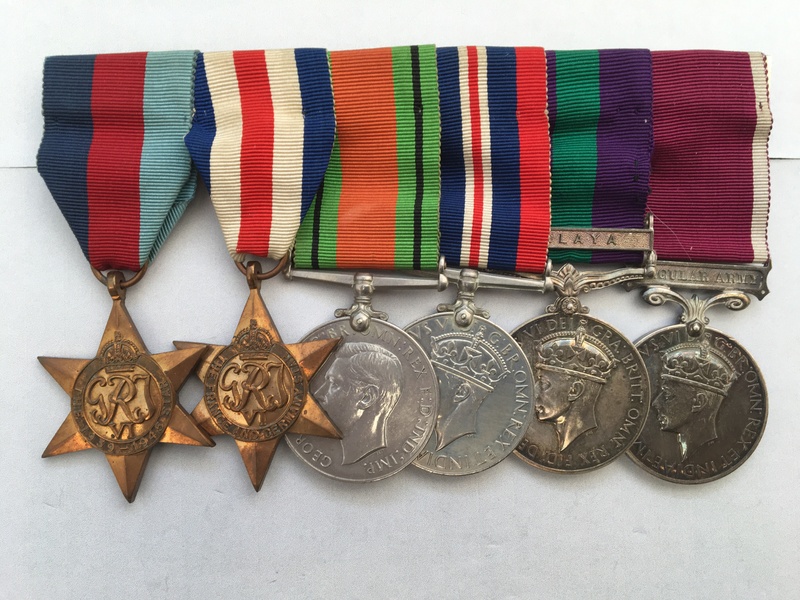 Given he was later awarded a George VI Army Medal For Long Service & Good Conduct, we can assume he was in the Regular Army prior to the start of WW2, serving with the Royal Corps Of Signals. By the outbreak of WW2 he would have been 38, and by 1940 he already held the rank of Regimental Quartermaster Sergeant, when he was commissioned as a Lieutenant in the Signals in August of that year, his London Gazette entry can be viewed by clicking on here. Having served in France and Germany during WW2, he was promoted Captain in November 1948, his London Gazette entry confirming his promotion can be viewed by clicking on here and he would have served in Malaya during the ‘Malayan Emergency’ sometime between his promotion to Captain in 1948 and July 1953 when Ball relinquished his commission. His London Gazette entry to this effect can be viewed by clicking on here, whereas a summary of all his London Gazette entries can be viewed by clicking on here. Details of the ‘Malayan Emergency’ can be viewed by clicking on here.